For more than a year, politicians and organizations have lobbied voters for and against the death penalty in Nebraska. Capital punishment split Nebraska&apos;s Republican governor and its conservative state senate over cost and whether it is moral. In 2015, Nebraska&apos;s senate — the state is unicameral, meaning there is only one legislative body — voted to repeal the death penalty. Some conservative legislators argued the death penalty wastes millions of dollars while others objected to the government killing its citizens. A recent study said Nebraska pays more than $14 million annually for the death penalty. But Gov. Pete Ricketts disagreed. He argued the death penalty gives families justice and vetoed the senate&apos;s bill. Nebraskans for the Death Penalty says the state estimates there is "minimal" to "no" cost for capital punishment. But in May 2015, the Republican legislature overrode Ricketts veto. The battle over whether Nebraskans who commit heinous crimes should be put to death will be settled on the ballot in November. Americans are used to Democratic vs. Republican political debates. But raucous contests among Republicans are rarer. While 31 states have the death penalty, 19 states and the District of Columbia do not use capital punishment. The quirk that makes Nebraska stand out is the state&apos;s conservative politics linked to an anti-death penalty stance. Bluer states typically oppose capital punishment, while red states support death for certain crimes. Nebraska&apos;s legislature is solidly Republican. The state has gone Republican in every presidential election since 1968. But a majority of the votes to repeal Nebraska&apos;s death penalty came from Republicans. Nebraskans for the Death Penalty and Retain a Just Nebraska, a group opposed to the death penalty, say they both have polling showing a majority of Nebraskans support their position. In October 2015, 61 percent of Americans said they favored the death penalty. A win for anti-death penalty supporters in Nebraska would show conservative voters will buy-in to an argument the death penalty is immoral and too expensive. The lives of 10 inmates are in the hands of voters this fall in Nebraska. Those prisoners, previously on death row, were given lifetime prison sentences when the senate overruled Gov. Ricketts. 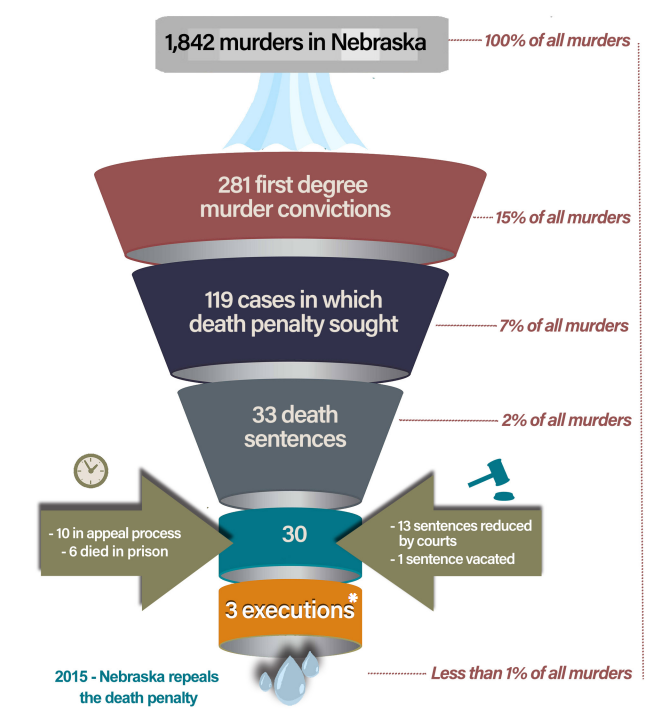 Nebraska has not executed anyone since 1997 and there have only been three executions in the state&apos;s history, according to a report commissioned by death penalty opponents. The report added that only two percent of convicted murderers were sentenced to the death penalty. For Nebraska voters, a vote this November to "repeal" would reinstate the death penalty in Nebraska because the senate-passed law still stands. A vote to "retain" would keep Nebraska death-penalty free.